Pet Partners serves communities in all 50 states and relies on an extensive volunteer network. If you have determined that there are no Pet Partners team evaluators located within a reasonable distance for you to attend an evaluation, you can be the catalyst to bring the Pet Partners Therapy Animal Program to facilities where you live. Become familiar with our Therapy Animal Program to make sure it’s the right fit for you. Review the policies and procedures and attend a free Volunteering with Your Pet webinar. You can even take the Pet Partners Online Handler Course through the Volunteer Center to have a deep understanding of the process and expectations for a therapy animal team. Next, contact us to receive the Community Expansion Toolkit. Please use “Community Expansion” in the Subject line. The toolkit contains important strategies and tips to help you get started. Once you’ve reviewed the materials, you’ll be ready to begin identifying others who would like to become Pet Partners teams with you. If you have questions at any time during this process, please let us know. For groups outside of the United States, we are excited to be in planning and piloting phases for international expansion of the Therapy Animal Program. More information is available here. To express interest and receive further information as it becomes available, please contact us. 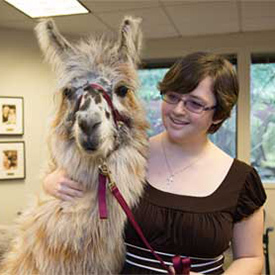 Considering becoming a therapy animal team? This recording of a live webinar will give you a basic overview of the Pet Partners Therapy Animal Program. Equines are rapidly increasing in popularity as therapy animals. Learn more about volunteering with a mini horse and how you can prepare to become a Pet Partner. It takes a special feline to be a therapy animal. Find out what to expect if you’re interested in becoming a therapy animal team with your pet cat.